When visiting Hawaii, you'll encounter many foods that may seem foreign to you. This is because Hawaii is a melting pot of cultures from around the world, with influences from the Chinese, Filipino, native Hawaiian, Japanese, Korean, Portuguese, Puerto Rican, Samoan, Thai, Vietnamese and others. In this part of our series on Hawaiian food, we look at the foods that you'll find at many luaus in Hawaii. While you won't find each of these at every luau, we've covered the foods that you're likely to find at most. In case you'd like to try to cook some of these foods yourself, we've included links to recipes for most of the dishes listed. Check out our recipes for such great tropical favorites as Mai Tai's, Piña Colada's, Blue Hawaii's, Lava Flows and many more. Whitefish fillets with mild or sweet flavor. This recipe is courtesy of the Polynesian Cultural Center on Oahu. This favorite made with mashed ripe bananas is often offered at luaus. You'll probably find one of these tropical-flavored cakes at almost any luau that you attend in Hawaii. Beef or chicken slices grilled or broiled in a sweet teriyaki marinade. This recipe is courtesy of the Polynesian Cultural Center on Oahu. These delicious rich, red spareribs are a favorite thanks to the Chinese immigrants to Hawaii. This national dish of the Philippines is a favorite at luaus. It is a stew with chicken and pork (or beef, shellfish) in a sauce of white vinegar, soy sauce, garlic, and peppercorns. Japanese style fried chicken most often served with Tonkatsu sauce. Sometimes called thread or bean noodles, they are boiled and served hot with pieces of chicken. You may also want to try this over a little white rice, with soy sauce. This recipe is courtesy of the Polynesian Cultural Center on Oahu. Another staple at most luaus, this Chinese side-dish is made with chicken and long rice, oriental vermicelli, or saifun (bean strands). A Hawaiian favorite made with chicken cooked with taro leaves (or spinach) and coconut milk. A modern Hawaiian favorite made with chicken stock, potatoes, onion, celery and creamed corn. A standard of Chinese cuisine, fried rice can be made with meat or seafood and a wide assortment of vegetables. A traditional Hawaiian coconut flavored dessert that is best described as a "stiff pudding". Steamed boneless pork, chicken or beef salted and wrapped in taro or ti leaves. This recipe is courtesy of the Polynesian Cultural Center on Oahu. Salt butterfish, beef, chicken or pork wrapped in taro or ti leaves and then steamed. A delicious side-dish found at almost every luau in Hawaii. This recipe is courtesy of the Polynesian Cultural Center on Oahu. These potatoes are served at their Ali'i Luau. 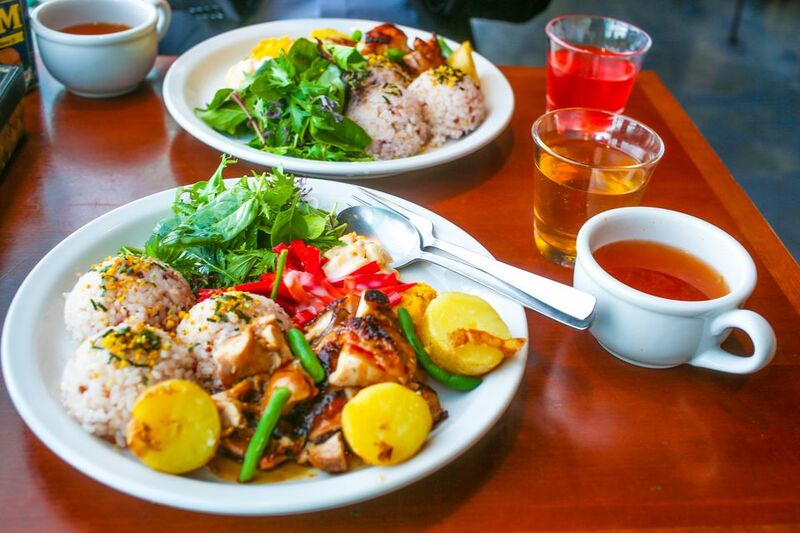 Grilled chicken halves flavored with soy sauce, pineapple juice, brown sugar, ginger, garlic, and wine. This recipe is courtesy of the Polynesian Cultural Center on Oahu. Hawaii's own version of barbecued chicken is cooked with Huli-Huli Sauce (made with pure Hawaiian brown sugar cane along with soy sauce, fresh ginger and more). This roasted pork recipe is courtesy of the Polynesian Cultural Center on Oahu. This is the main course at their Ali'i Luau. The featured dish at every luau, Kalua Pig is slow-cooked whole in an imu (underground oven) for many hours. Great as a dip for pupu's (appetizers) or a stand-alone side dish, Korean style Kim Chee is made of fresh island cabbage, chili peppers, ginger, garlic and other seasonings. A Hawaiian pudding made of taro, brown sugar and coconut milk. From the Hawaiian words to massage, knead or rub, Lomi Lomi Salmon is made with cold diced salmon, tomatoes, and onion. It is found at almost every luau in the islands. Taro leaves, often baked with coconut cream and chicken or octopus; the word eventually came to mean a Hawaiian feast, which is also known as 'aha'aina or pa'ina. A mainland favorite brought to Hawaii is served at many luaus. Like many salads, it can be made many different ways. This version of mango bread is a recipe by Hawaii's most famous chef, Sam Choy. Still grown in Hawaii, fresh Maui Gold pineapple can almost always be found at a luau, often in chunks at the salad area. Hawaiian-style beef jerky made with flank steak strips marinated in soy sauce, red peppers and water, dried in a dry box. Served at the Polynesian Cultural Center Ali'i Luau. One of the staple foods of the Hawaiian diet, poi is a thick, purple-colored paste made by pounding taro. Poi can be bought fresh or "day-old," which allows a sour flavor to develop. Poi is labeled "one-finger," "two-finger" or "three-finger" to describe its consistency--the thicker the poi, the fewer fingers needed to scoop it up. Today is it used in many Hawaiian recipes or served as a side dish. Most often seen made with the freshest raw ahi (tuna), poke makes a great pupu (appetizer) for any meal. A delicious soup made with cabbage, kidney beans, and Portuguese sausage. Portuguese Sweet Bread Portuguese sweet bread (pao doce), sometimes labeled Hawaiian sweet bread, is a staple and good for making French toast in the morning. Portuguese sweet bread (pao doce), sometimes labeled Hawaiian sweet bread, is a staple and good for making French toast in the morning. The pupu platter found at many luaus is basically a platter of hors-d'oeuvres, island style. Check out our recipes. This Hawaiian favorite white, sweet, moderately dense fish is most often served at luaus either baked or sautéed. Chicken marinated in soy sauce, sugar, garlic and ginger. This recipe is courtesy of the Polynesian Cultural Center on Oahu. Squid Luau, is a Hawaiian dish made of squid and luau leaves cooked in coconut leaves until tender. Also known as kalo, taro leaves are eaten as a vegetable or wrapped around fish and meats. The root is cooked and pounded into poi. Taro rolls are simply delicious, much moister than other rolls you'll ever eat. This recipe is for the rolls served at the Polynesian Cultural Center Alii Luau. An island favorite of beef marinated in teriyaki sauce and island seasonings and then broiled or grilled. The same recipe can also be used with chicken. Check out these recipes from About.com's Guides to Chinese and Japanese Cuisine. Ti leaves are used in Hawaiian cooking to wrap foods that are to be cooked. The leaves are removed before the food is eaten. Dried ti leaves, which can be found in some ethnic markets, must be soaked to soften before they can be used. An excellent cookbook by one of the premier chefs of Hawaiian Regional Cuisine. Wong shows you how to take traditional luau foods and prepare them in all new and exciting ways. This book is a great place to start if you want to hold a luau in your own backyard. It covers everything from how to cook a kalua pig and other luau foods to even how to crack a coconut. If you're looking to find out how to make that specialty Hawaiian drink, this book is for you. The recipes in this first book are distinctly Hawaiian, sharing the global perspective of many Hawaiian menus.